We are delighted to welcome our next curator, Samantha Yammine (@samanthazy). 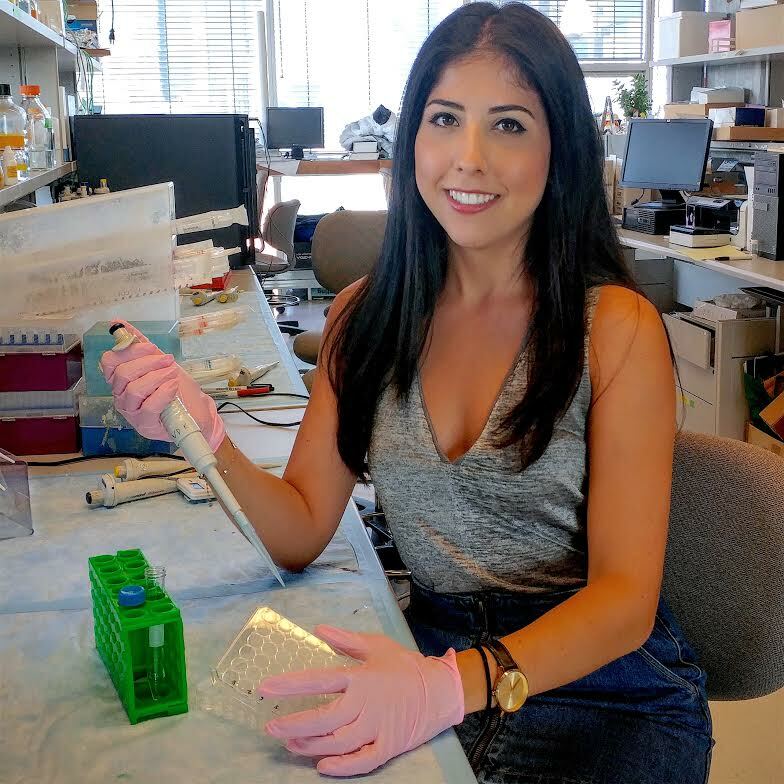 Samantha is a PhD Candidate in the Department of Molecular Genetics at the University of Toronto studying stem cell biology and brain development in Dr. Derek van der Kooy’s lab. Her research aims to create a cellular hierarchy that breaks down how stem cells build and maintain the brain. Samantha is a passionate science communicator and advocate, and teaches neuroscience and genetics to undergraduates on campus as well as to the public via a variety of social media initiatives. Samantha wants to strip science from the hype it wears in the media and show the world that even really basic everyday experiments done in the lab are interesting and important. She features different science trainees on her Instagram (@samanthatzy) every Friday to showcase how relatable and approachable people who do science are, in hopes that this will be the first step in helping scientists connect better with the public – aka the people who fund their work! Here’s Samantha’s story. I really wanted to study science because I always had so many questions about the world around me – how things work, why things happen, what happens if X or Y are changed in every hypothetical scenario imaginable… Eventually I got to the point where there weren’t answers to all my questions and I was too stubborn to shrug them away, especially once I realized that I could try to find the answers myself. The real irony is that I’ve learned that the more you answers you find, the more questions pop up, but by the time I figured that out I was already hooked. People are fascinating to me, and in high school I spent a lot of time thinking about what made people act certain ways and how differently people might view the same world. Around this time my uncle was also diagnosed with Parkinson’s disease, a degenerative disorder that really changed his own life and the lives of his caregivers. I remember sitting at home one Friday night and Googling things about the brain to learn more and I came across the definition of “neuroscience” and I ran to my mom and exclaimed, “mom! I know what I’m gonna do, it’s called neur-o-science!” I eventually did do some research on neurodegenerative diseases like Parkinson’s and Alzheimer’s, but the more I learned about the degenerating the brain the more I became fascinated with the generation of the brain, which is how I stumbled upon the booming fields of stem cell biology and developmental neuroscience. I get to ask a lot of questions about cell fate and lineage relationships, which can get quite philosophical at times and is a whole lot of fun. The adult human brain contains about 160 billion cells and over 1000 different cell types, all of which are critical for the complex motor, intellectual, and sensory tasks our brains let us perform everyday. The more I learned about the intricate complexity of the brain, the more I became fascinated by the question, “how the hell can so many different cells be made in such a short amount of time? !” I therefore set out to complete my PhD in Dr. Derek van der Kooy’s lab with my goal to try to find the earliest precursor of the brain in the developing embryo and figure out how it builds the many different cells of the brain so quickly. The best candidate we’ve found for the “ultimate builder of the brain” is a type of brain stem cell, which our lab has termed a “primitive neural stem cell.” My research therefore lies at the intersection of stem cell biology and neuroscience, and I use genetically modified mouse models and cell culture techniques to construct a hierarchy of the cells that build the brain during development. We’ve also found that the same types of brain stem cells that help build the brain in the early embryo are also present in the adult brain. While they are very busy dividing to build the brain during embryonic development, in the adult brain these brain stem cells are rather quiet and don’t do too much. I am currently working to identify ways to “wake up” these cells from their quiet state in a controlled manner, which may be helpful for future therapeutic strategies aiming to help the brain repair itself after injury or degenerative disease. While stem cell biology offers a lot of hope for the future of medicine, it is first important to understand a lot of the fundamental principles of how stem cells work before we can expect any hopeful outcomes in the clinic. My work therefore aims to understand the complicated manner in which the brain builds itself, so one day we can be more informed when trying to help the brain RE-build itself following injury or disease. I am very committed to a personal passion project I started that aims to engage people everywhere with science research and the fascinating people who do it. 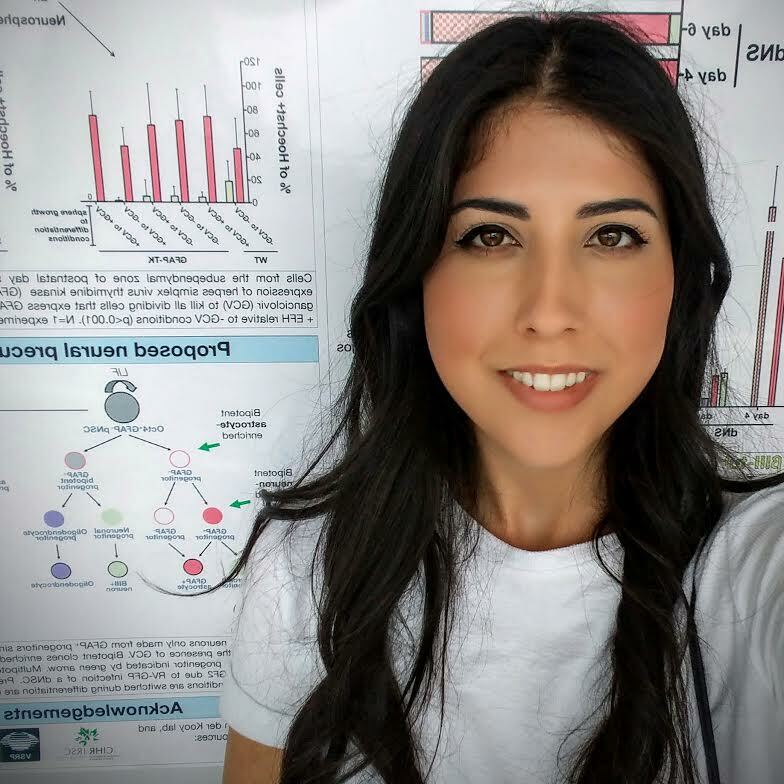 I use using my Instagram account (@samanthatzy) to share my research with others and highlight inspiring role models in the research community. By doing this I hope to show that science research isn’t always about curing diseases directly (as it shouldn’t be), and also that the people who do science are actually more relatable and approachable than one might think. I am also a Co-Founder of a Career Development Initiative that runs a monthly workshop series for trainees at the University of Toronto. We were generously funded by the Genetics Society of America last year and have quite successful in inspiring trainees that there is hope for a meaningful career after a PhD and/or Post-doc. When I’m not in the lab, I love to experiment with new recipes in the kitchen – I’m always up for trying new food! I am also an avid soccer player, and recently have been training in muay Thai with no plans of stopping. My ideal day is a finely balanced mix of activity, eating, and relaxing. It’d have to start with a big breakfast, include some time relaxing in the sun at a beach or park, a visit to a farmer’s marker or interesting artisinal market, and if it’s a really special day off then somehow a visit to a winery would certainly be in order. … sometimes days off are busier than workdays! Please welcome Samantha to Real Scientists!